On this 8-day all-lesbian small-ship adventure cruise, the majestic beauty of the ancient kingdom of Hawaii will unfold, as we sail from the Big Island to Molokai, anchoring in the sheltered, coconut-fringed bays inaccessible to larger vessels. You’ll enjoy an exhilarating week of unparalleled outdoor adventure and meaningful cultural exploration. You’ll delight in kayaking, snorkeling and paddle boarding in the coral-lush waters teeming with tropical fish, sea turtles, giant manta rays, dolphins and whales. We’ll even visit the Humpback National Marine Sanctuary (the only place in the U.S. where these magnificent creatures reproduce) at the height of the migration season. Along with a nature-fueled rejuvenation, this trip will inspire a deep appreciation for Hawaii’s history, people and culture. You will feel the past come to life through traditional storytelling at the Lana’i Culture and Heritage Center, break bread with locals at an evening “pa'ina” celebration, and sway your hips to the rhythms of a “kanikapila” jam session. 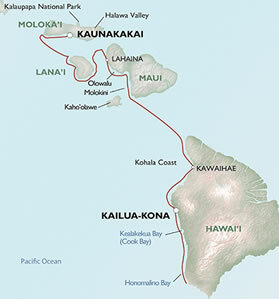 Cruising between four islands-Hawaii, the Big Island, Maui, Lana'i, and Moloka'i-experience a new Aloha about a 36-guest boutique yacht. Designed for comfort, with an elegant atmosphere, and in the spirit of adventure, the Safari Explorer is a perfect platform of discovery. Three public decks make it easy to see action in the water and provide plenty of room for relaxing and breathing fresh air. An intimate Wine Library, salon, and inviting dining room encourage mingling and camaraderie among guests. 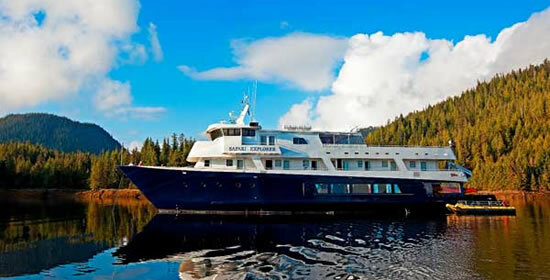 The Safari Explorer is adventure equipped: kayaks; paddle boards; inflatable skiffs; snorkel equipment (Hawaii only); and hiking poles and a full-beam swim step for easy access in the water. A hydrophone provides the opportunity to listen to below-surface sounds and a bow-mounted underwater camera pipes the action to the lounge and to TVs in each cabin. 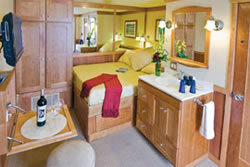 The spa area includes a large on-deck hot tub, fitness equipment, yoga mats, and complimentary massage. 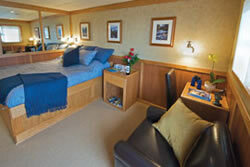 Common to all cabins are: Heated tile floors in bathroom; air conditioning; Tempur-Pedic® memory foam mattresses; flat-screen TV/DVD; iPod docking station; view windows (no portholes); private bath with shower. Itinerary is guideline; variations in itinerary and the order days may occur to maximize your experience. Welcome to Hawaii! You'll be transferred to our hospitality area to gather with fellow travelers and meet your Olivia staff and Expedition Leader. Following an introduction to the week ahead, a private transfer takes you to the Safari Explorer, awaiting dockside at Kawaihae Harbor. Set sail and enjoy the sunset before dropping anchor for the evening. 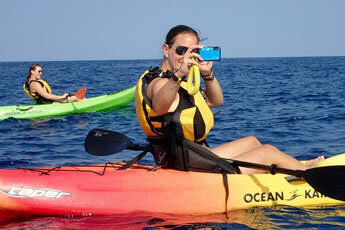 The search is on as you set sail through an area known to be favored by marine mammals. Lava tubes, skiff tours and kayaking are in store for a day of ultimate adventure. Fringed by coconut palms, Honomalino Bay offers opportunities for snorkeling, paddle boarding and more kayaking. 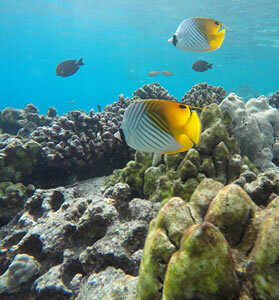 The bay reveals a diversity of colorful corals, sponges and tropical fishes. This evening, you’ll anchor at an offshore location to search for and night snorkel with Giant Pacific Manta Rays. 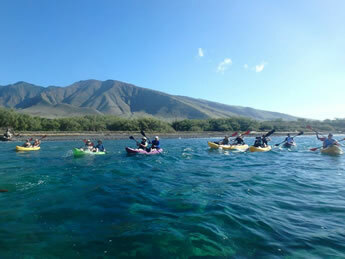 Skiff to Kealakekua Bay, where Captain Cook was slain in 1779, for some of the island’s best snorkeling. On a guided exploration by kayak and skiff, your expedition team shares their knowledge about the marine life and history of the bay. At Kailua-Kona, stroll through town at your own pace, and uncover the charm of this historic town. Leave it to your Captain and crew to seek out and unveil the best opportunities the islands hold in store today. Dramatic volcanic backdrops, marine life sightings, and chances for snorkeling, kayaking and paddle boarding are all possible! Gear up for a day of play on the "private island". Thousand-foot sea cliffs line the shore and ancient volcanic plugs sit both above and below the water's surface as host to a wide diversity of marine life. Snorkel, paddle board, kayak, and explore by skiff. Choose a long or short hike–whichever suits your fancy–to Sweetheart Rock, a sea stack jutting 80 feet above the crashing surf, and discover the legend of the princess Puu Pehe. Learn about the island’s plantation days with a visit to the quaint Lana'i Culture and Heritage Center. 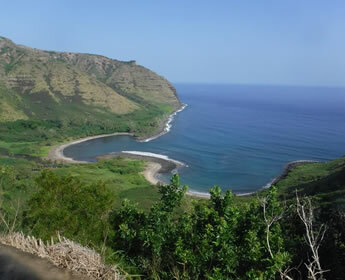 In ancient times, Olowalu was considered a place of refuge. Today, it delivers a treat of snorkeling among coral gardens teeming with underwater life and a known sea turtle habitat. 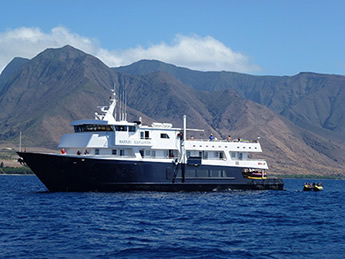 The Humpback National Marine Sanctuary—located between Lana'i, Moloka'i, and Maui—provides front-row seats as you cruise through these productive marine breeding grounds searching for dolphins, whales, and other marine life. 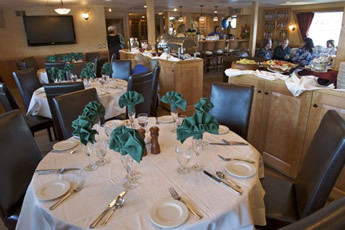 Cap off the day and celebrate this evening with the Captain’s Dinner. A warm Aloha spirit gives you a sense of Hawaii long ago. No stop lights, no high-rises—just a welcome slower pace. “Talk story” with locals and experience their land and traditions as few visitors do. You’ll hear legends and lore, then take in a cultural lesson in taro patches and poi making, or hike to a towering waterfall in Halawa’s cathedral valley–one of the island’s most historic places. At the Moloka'i Museum, discover the history of this ancient homeland as you enjoy an evening pa'ina (feast), complete with a home-style Hawaiian jam session. Gather for breakfast before the Safari Explorer docks on Moloka'i, where you’ll be transferred to the Moloka'i Airport or to your extended host hotel stay. Bridge Deck. Cabins: A1-A2. Separate sitting area; king or twin beds; view window and a sliding glass door opening to a small balcony; private bath with Jacuzzi tub and shower, fridge. 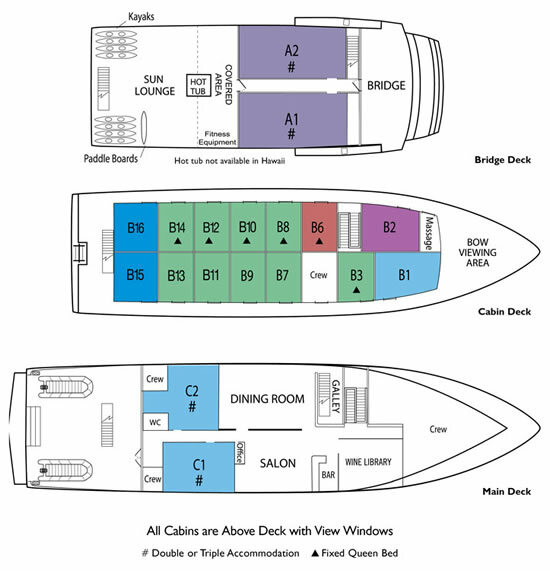 Cabin Deck, Main Deck. Cabins: B1, C1-C2. 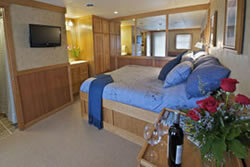 King or twin beds; windowed door or view windows; private bath with Jacuzzi tub and shower. Cabin Deck. Cabins: B3, B7-B14. Queen or twin beds; view window and windowed door; private bath with shower. Please check back soon! We are working on getting all the details just right for you! Rates: Prices are per person based on double occupancy. Pricing does not include airfare, insurance, fuel surcharge or NDA of $599 pp (subject to change). Early bird prices valid until July 11, 2019. Availability updated weekly and is provided for informational purposes only. The accuracy is not guaranteed. Olivia & HappyGay Travel will not be held responsible for any errors, omissions or inaccuracies. It is advised for guests to check information provided on this site with an HappyGay Travel Travel Consultant. Web Page © Happy Travel, Ltd. Logos and Images © RSVP Productions Inc., Atlantis Events Inc., Olivia, etc.